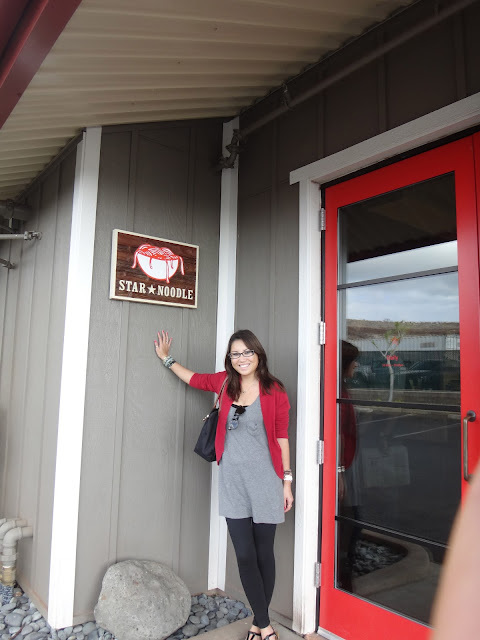 I'm absolutely obsessed with Star Noodle, located in Lahaina, Maui. Too bad I only visit Maui once a year! If you are ever in Maui, you must make the trip to beautiful Lahaina and find Star Noodle. It's worth every cent spent on gas and every cent spent on the food. Plus, the drive to Lahaina is gorgeous! Go around this time and you will spot a humpback whale every time you look out onto the ocean. An amazing sight. Anyway, back to Star Noodle. SN only opened about a couple years ago, but they are hustlin' and bustlin' with tourists, locals, everyone. And who can blame them? Located in the quiet town of Lahaina, they have their own property with a decent-sized parking lot. Atmosphere is perfect for an early Happy Hour with some small bites, or I'm sure it's buzzing with the night crowd, drinks constantly being poured. I've heard that if you go at peak hours, you will have to wait at least 45 minutes to an hour. Since they are open all day, I suggest going for an early dinner. It was perfect around 530pm! As for food, you MUST MUST MUST try their Brussels Sprouts! Trust me, I don't (or didn't) care much for the green vegetable itself, but man, are these amazing. Pan-fried with butter and bacon first, and then finished off in the oven, these babies are astonishingly tasty. 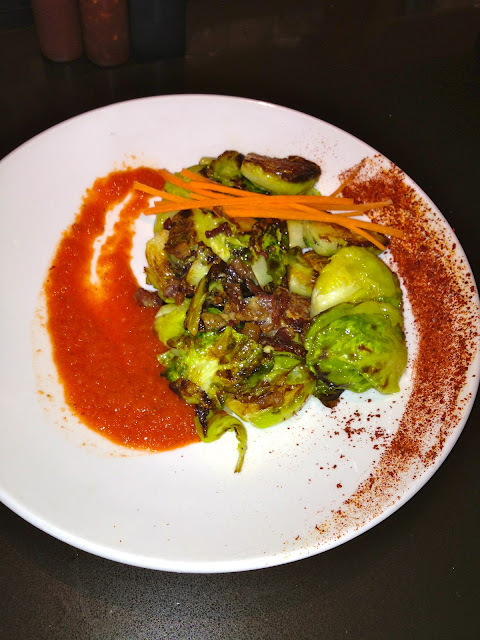 This was my favorite dish- Dad and I loved it so much we ordered a second round of brussels sprouts! Other hits- Steamed Pork Buns- tender cuts of Duroc Pressed Pork with a hefty amount of fat attached, hoisin sauce, Shiitake mushroom and cucumber. Only 3 pork buns to this order, so you may need to order two! We also ordered their hyped-up Hapa Ramen, which Dad and I thought was mediocre. Definitely didn't live up to the hype. Being the ramen-lover that I am, I expected more, but have had better. It's definitely worth a try, though, if you haven't had Black Ramen (Spicy Aka Miso) before. Dad gobbled up our order of Garlic Noodles. We took the suggestion of our awesome server, Zane, and added mushrooms and bacon to it. Definitely order it that way. I think without the mushrooms and bacon, it would be very plain. If you like garlic (like me), then you will love this dish. By the end of the meal, we were absolutely stuffed. No room for any dessert, but local-speaking Zane gave us a scoop of their Banana Bread Gelato, complimentary! And believe it or not, it tasted exactly like banana bread. They must have mashed up the banana bread and froze it. Amazing stuff. Next time (which will be VERY soon), I'm trying their Vietnamese Crepe. Stuffed with Shrimp, Pork, Bean Sprouts and Nuoc Cham, this is also said to be a favorite among Star Noodle-ers. I'll be back, Star Noodle!! !